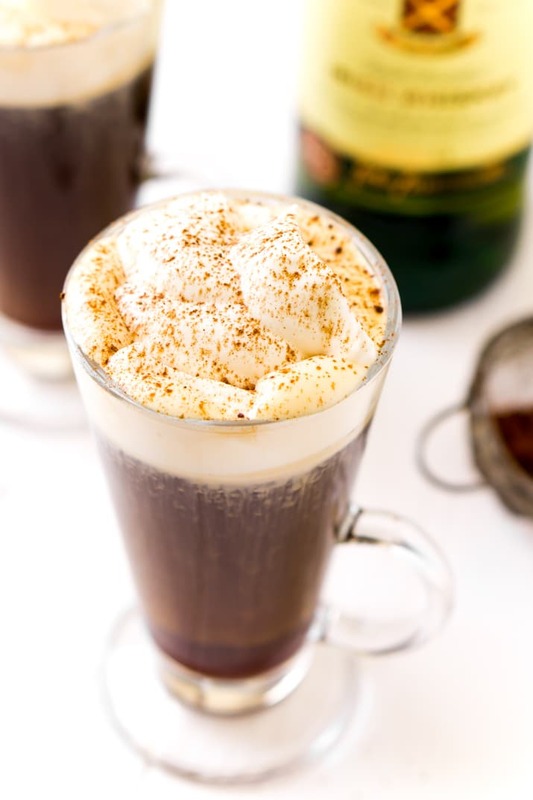 This Irish Coffee recipe is a traditional drink recipe made with coffee, whiskey, sugar, brown sugar, and whipped cream. A spiked coffee for weekends and dessert. If you’re anything like me, you can’t start the day without a kick of caffeine, but when special occasions roll around, they call for cocktails! That’s why I love making this traditional Irish Coffee recipe on holiday or weekend mornings. If you can’t wait to try it, you’re in luck (get it?!) because a festive little holiday called Saint Patrick’s Day is just around the corner! What’s In An Irish Coffee? 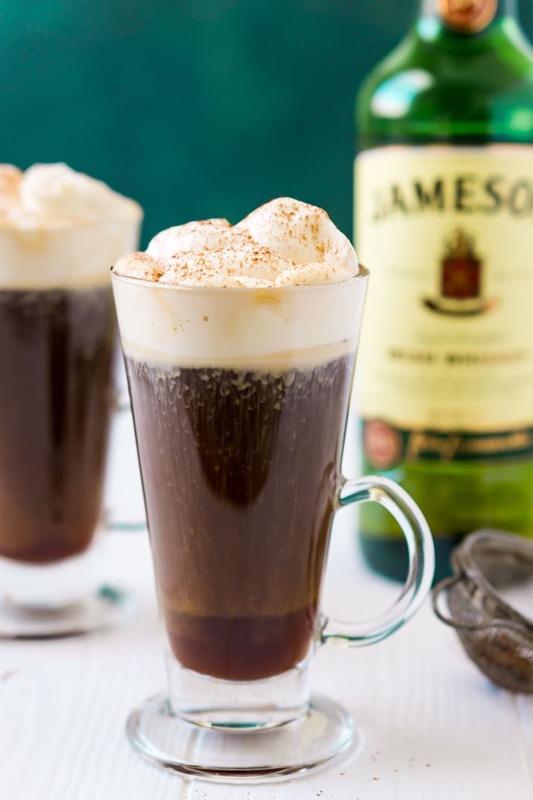 Irish Coffee is made with coffee (of course), whiskey, a little bit of sugar, and some fresh whipped cream. Caffeine and booze… now that’s what I call the best of both worlds, amirite?! My secret for adding a little depth to this recipe is to use brown sugar in addition to white sugar, giving a subtle hint of molasses flavor. The second trick is to only whip the cream lightly so it makes as a frothy layer on top. 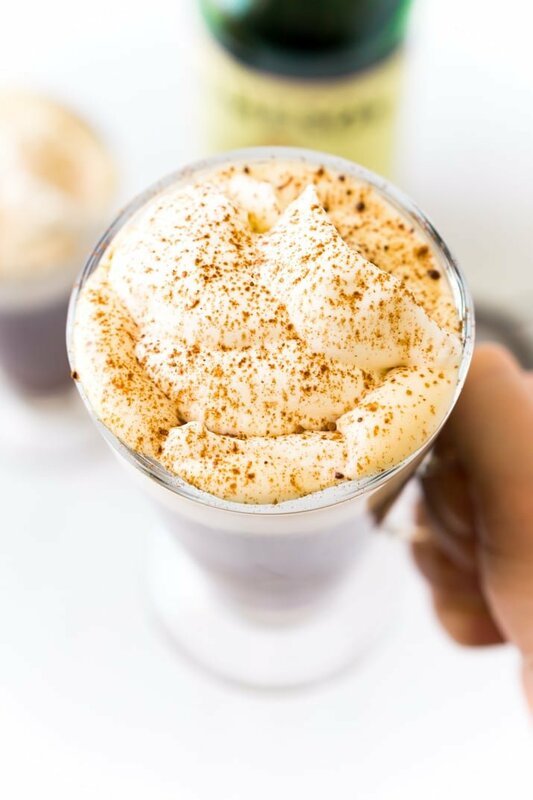 Think of this drink as a kind of spiked cappuccino, with a touch of sweetness and a nip of the good stuff! That means it’s totally appropriate to enjoy one of these beverages before noon, even if it does have a shot of whiskey in it. 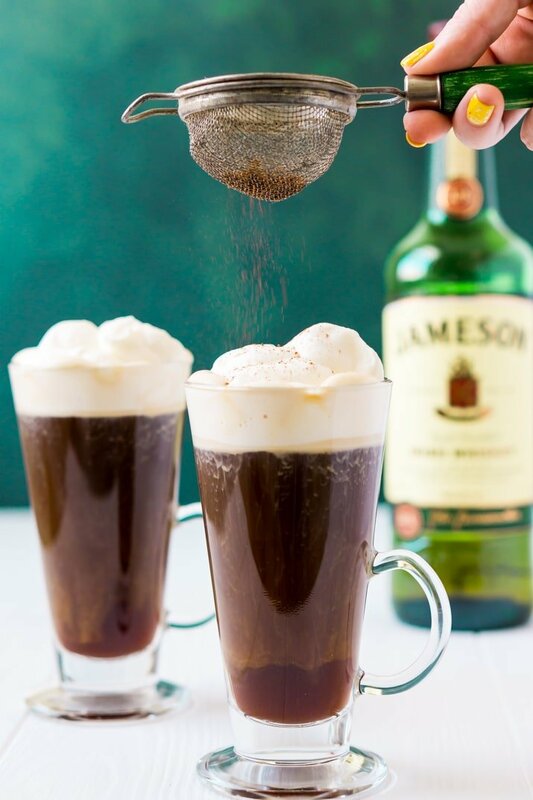 Irish Coffee is the best way to get the party started early. After all, who said that you couldn’t have booze with breakfast? These steaming mugs of happiness aren’t only for special occasions, though. From experience, I can tell you that there’s nothing better than savoring this caffeinated cocktail on lazy weekend mornings. If you’re a brunch fan like me, you should know that this drink pairs perfectly with pancakes, French toast, bacon, hash browns… you name it! Not to mention, this recipe will warm you from the inside out when the weather is chilly. I also love serving these hot beverages with dessert whenever I’m hosting guests for dinner. They taste so scrumptious alongside tiramisu, pie, cake, cookies… you name it! And if you really want to have a good time, try pairing it with my boozy Irish Cream Cake. 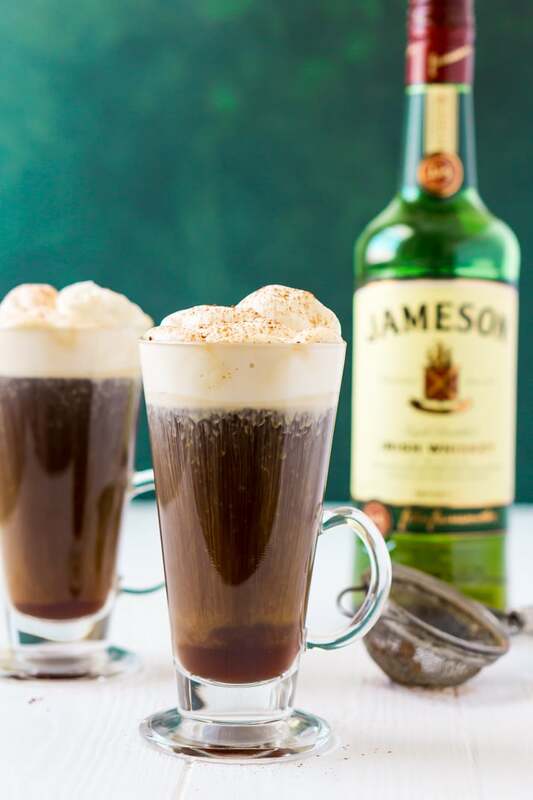 Caffeine and whiskey fans alike will love this traditional Irish Coffee recipe, the cozy way to start — or finish — a special day! This drink is fairly easy to make, but it’s important that you follow all the steps to ensure the best drink possible! In a medium bowl, combine the heavy cream and the powdered sugar and beat with a hand mixer until soft peaks form. Set aside. Fill a large glass mug with hot water and pour out. Pour in the coffee and add the granulated and brown sugars, stir until sugars have dissolved. Add in the Irish Whiskey. Spoon the softly whipped cream on top of the coffee. Feel free to dust with cocoa powder, chocolate shavings, or nutmeg. You need to use an Irish Whiskey, preferably Jameson or Bushmills. This recipe is generally served in glass Irish Coffee Mugs, usually taller mugs with a handle. Make sure to only whip your cream just until soft peaks form, you don’t want stiff peaks, you want more of a froth on top of the coffee. If you prefer sweeter Irish Coffees made with Irish Cream, simply swap the whiskey for my Homemade Irish Cream. This recipe is a traditional drink recipe made with coffee, whiskey, sugar, brown sugar, and whipped cream. A spiked coffee for weekends and dessert. This recipe is generally served in Glass Mugs, usually taller mugs with a handle. Make sure to only whip your cream just until soft peaks form, you don't want stiff peaks, you want more of a froth on top of the coffee. This is a festive addition for any St. Patrick’s Day party! 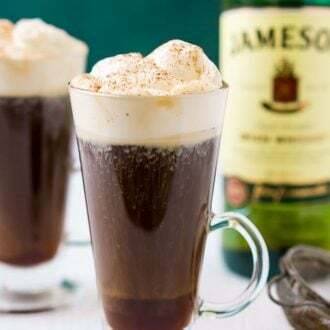 Love this and the Irish Cream recipe too! Thanks, Marjory! Definitely give both of them a try! I’m so addicted to these now that I discovered them on the last trip to Ireland. I need more in my life. Your tutorial is great, makes it so easy for everyone to create this fab drink at home!